Seller uses online, offline marketing to sell domain name. 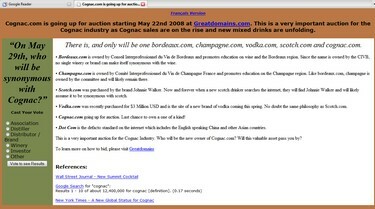 Cognac.com sold for $88,000 in last month’s GreatDomains auction. But the story isn’t the sale price — it’s the way the seller marketed the domain name. It’s unclear who the seller was. Before the transfer the domain was in Domain Capital’s name, but that just means one of its clients owned the domain. The previous owner according to whois was a gentleman in the British Virgin Islands. The e-mail address associated with that record bounced. Sedo GreatDomains auction ends Thursday. Here’s a look. well the auction page is still up on the domain, did it sell? Yes, it sold. New owner in whois, they just haven’t updated it. Bet it’ll be flipped to an end user/ distiller/ distributor/ retailer w/in the next 24 months for 5-10x that amount. Congrats to the wise investor/s. Can’t argue with 88k…but I really envy the FLIPPER. Good grief, that’s CHEAP! Flip time, happy time coming for the buyer. Hmmm, don’t know if I’d call it “cheap”. Hopefully we aren’t using Vodka.com as the comparison. How many people have tried to sell domains similar to Vodka.com since then and haven’t sold them? I like the “honesty marketing” approach! Much better than just a boring “for sale” link with an equally unsavory form to “send in an offer” to the domain name owner! Hurray for creativity, initiative and… honesty. Wow 88.000 already in these times back is a lot of money. And they sold the domain, 5 years later, for 140.000 which makes more than 60% Return on Investment. Nice one!